You guys when I was invited to be a guest teacher on the year long course “Art Walk Alchemy” with the 2019 theme of “Totems and Talismans” how could I resist! I mean the thought of it made me swoon! We all want to create from our soul, things that are special to us, give meaning to our lives…make each moment special. To me that is what totems and talismans are all about 🙂 They are symbols of the things we hold dear and the beliefs we uphold. For me the spirit world embodies all those things. This is a year long course that is all about those ideas, objects, and emblems that represent something significant in our lives. 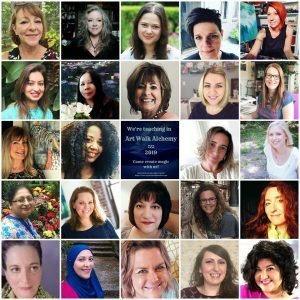 You get 24 lessons (plus several bonus lessons!) that incorporate literal or metaphoric representations in the form of assemblages; journaling; jewelry; masks; watercolor, pastel, and acrylic painting; mono-printing; explosion boxes; collages; spirit dolls; and mixed media. 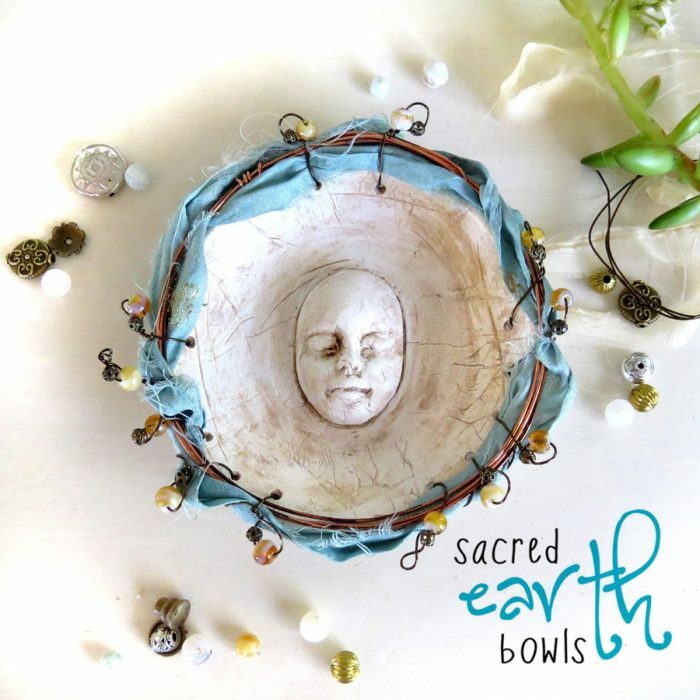 In my lesson we will create a gorgeous “sacred earth bowl”. Your bowl will encapsulate the spirit of mother earth and the faery realm, or as I like to call it the “otherworld”. We will use air drying clay, recycled copper wire, scraps of sari silk and small glass and metal beads to embellish our piece. The colours will be those of the earth elements, fire, water, air, you choose what resonates with you. This lovely bowl was created with the water and earth elements as the basis. She is my prototype for the course, the bowl I will film for my lesson will be almost identical, I’ll probably choose different colours and beads, but this is the bowl style I will be demonstrating. To find out more about the course Click Here using my personal affiliate link. This is your way of supporting me as a teacher and is very much appreciated! There is an early bird price of $99 if you sign up before December 31st and also an installment plan! 1. Share this post on Facebook (share button is below this post). 2. Leave a comment below letting me know your favourite earth element and why (earth, air, fire, water). *** for a second entry into the draw comment on my facebook post here as well ! I will announce the winner of the bowl on December 1st (AEST). As an Aries my element is fire but I love all elements :). Thank you for the opportunity Toni! It would gave to be water. The bowl is beautiful. I would love to win it! Air is my choice as I love the birds and clouds. Thanks for a chance to win the bowl u created. I love the colors. Water because it is a calming feature as well as a source of life. Earth. We come from the Earth, we return to the Earth. We live in, on and around the Earth. It holds traces of all who came before us, as we will leave traces of ourselves for the future. Life springs forth from the Earth, only to return to it so life may start anew. My element is Earth because it is grounded and solid. There’s a feelinng of security with mother earth. She always looks after the ones that lean towards her. I find it very comforting and asuring. 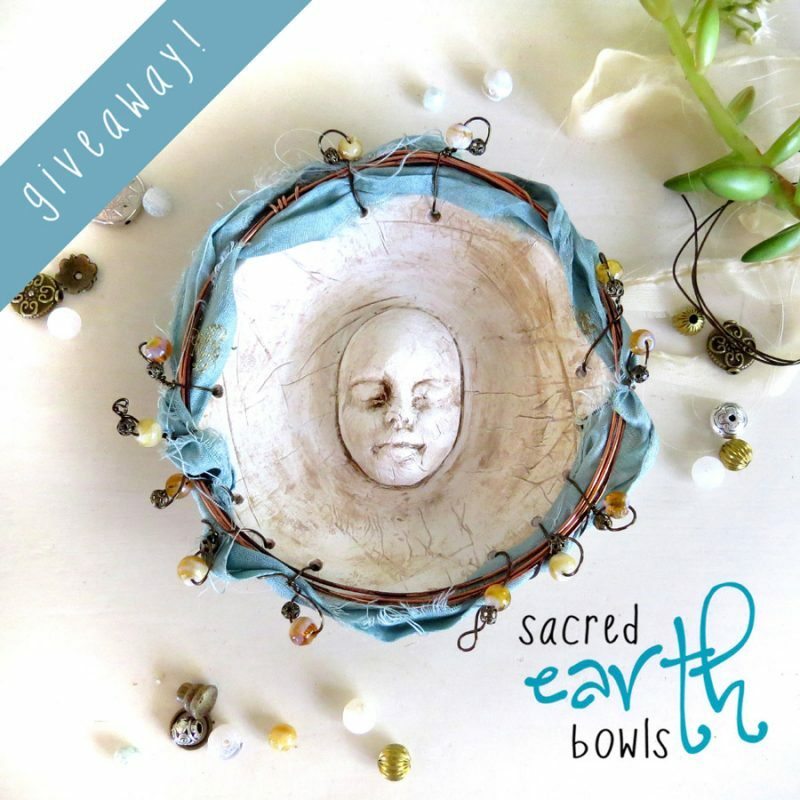 Thanks for the opportuntiy to win this awesome little earth bowl! I liken it to earth as it is solid, stable and reliable! Water!! ….but should be salty …and warm! 🙂 Thank you sweet Toni! My favorite element is earth. It’s where I feel grounded and at peace. I love the feel of the soil, I walk in my bare feet all summer long just to be closest to it. It’s where I feel most comfortable. Thank you for the opportunity of this giveaway, and for offering the class again. Peace. Fire is my favorite. I dislike being cold. I love my water sign, being a cancerian i am ruled by the moon, the tides of the earth and feel thay being drawn to water i can reflect on my life events. I find the lull of sea has an amazing hypnotic effect on me. I also love the earth for it yeilds beautiful plants, trees, flowers and crops and without these we could not exsist. And i love the wind as it helps to blow the conwebs away esp in the winter months when things go back to the earth to regenerate for the spring, im not so keen on ice as it is cold lol, but love the cool fresh morning’s of the cool refreshing snow. Thank you for this amazing chance to enter . My favorite element will probably always be water, secondly earth. I love the movement and sound of water nearby, refreshment, floating, etc. But I could never leave the scent of soil as well. My favorite element is water. I’ve always been drawn to water. I live a few minutes from Lake Michigan and spend a lot of time there. It “grounds” me, brings me into life. Thanks for the opportunity to win, I love your work! As an Aquarian my element is air. Who doesn’t need air, right!! My constitution is fire but I love its opposite water…so calming to the sirit, contantly moving for the eye, sounds wonderful to the ear, feels amazing and..when fresh…tastes like a cup of cool crystal. Without it the earth and all upon it vanish with the water. My element would be fire as I am always hot to learn new things always!!! Thanks for the opportunity to win this breathtaking bowl! Thank you for this opportunity, Toni!! I believe I am most connected to the earth. I love nature and mountains. Earth is my element, grounded and loyal. And I connect with water as I am intuitive and sensitive to other’s energy. This course is gonna be amazing! My dear element is air. Since my two brothers are born equidistant around the cycle of the year, we are all air signs. Curious, creative, spiritual and altruistic, all three of us! Water because I am a water dragon. I am an air sign, a curious, inquisitive, free spirit. I love all forms of communication, especially the arts. It would be such an honor to recieve your bowl. Thank you for your consideration. Air is my earth element (Libra) but earth resonates strongly too. The blue ribbon on your bowl speaks to my water sign…cancer. Congratulations, Toni for being chosen to be one of the teachers! Fire is my element (Leo). My passion for people and their wellbeing is what fuels me! Water has always been my element. If only I could move my home oceanside. The Earth element is most special for me. As our Native Americans, especially the Hopi, believe we get everything we need from our Mother Earth. We have a responsibility to treat her gently. Being a Taurus I am an earth sign …Ancient Roman astrologers considered Taurus to be rules by Venus, the goddess of beauty, while modern astrologers consider Earth, the primordial goddess of the earth and life an the sign’s modern ruler. Love your beautiful bowls & all things earthy! Thank you for the opportunity to win this beauty! Thank you, Toni. My element is air. It’s both my sign (Libra)and soul. Appreciate the chance to win a spot in this interesting course. My element is earth. My favorite place to be is outside in the woods where my thoughts can clear. I love this beautiful bowl and will love learning how to make one 🌏. I choose earth 🌎. Nature is the best canvas for the imagination. I have to choose earth as my favorite element. I love nature and all that it encompasses ! Would love, love, love this. Thank you for the chance. I am an earth soul. I love to connect with the earth by gardening and you’ll always find me with bare feet, summer or winter. I’d love to win your beautiful bowl. ❤️ I have shared and left a comment on your Facebook post. The course looks wonderful, I hope to join before December 31. Mine would be water…..the calming sound of it is good for the soul. That is my favourite bowl Toni. My favorite element is water. I love its movement, it’s calming effect and even its sound is like music. To me water is magic. Thank you for this opportunity! I love the earth. So many things come from it. I love this bowl and would be ecstatic if I won. Ooooooo mine is water. Even if I wasn’t a Cancer I Believe it would still be Water. Thanks for offering up this Beautiful bowl for a give-away. It’s truly lovely.